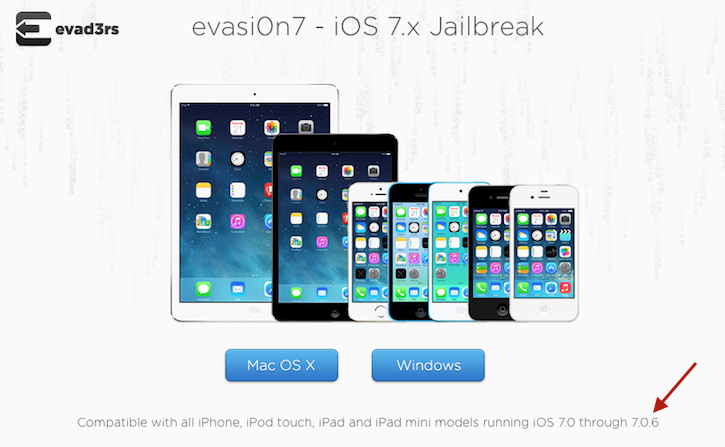 Evad3rs, developers of the iOS 7 jailbreak Evasi0n7, have announced on Twitter that the recently released iOS 7.0.6 is now jailbreak-ready. Evasi0n7 has been updated to the concurrent version 1.0.6. Earlier today we posted a piece that showed how to jailbreak your iOS device using a Hex code editor. There is no need to do so anymore. The latest Evasi0n7 tool does the jailbreaking for you with the click of a button. Users interested in jailbreaking their iDevice can head over to the Evasi0n website to do so. Note: Thanks "VBLUE42" for the heads up.